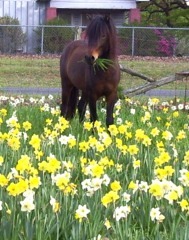 This is an organization of breeders and enthusiasts of the Dartmoor pony in North America. Our main goal is to preserve this unique and rare breed and to do what we believe is in the best interest of the Dartmoor pony! We invite you to join us in our efforts with the hope that these ponies will bring you as much joy to your life as they have brought to ours. From a genetic perspective, having a daughter society in the US is the best thing we can do for the breed. This is because US Dartmoors could then be part of the international interbreeding community. The larger the size of an interbreeding population, the better it is able to survive as a healthy community. Larger population sizes prevent inbreeding, which has a negative effect due to the homozygosing of gene forms (two of the same gene forms in the same animal) that affect survival and fertility. Large population sizes also promote the maintenance of genetic variability in the population, which would otherwise and unavoidably (due to random chance, a phenomenon known as “genetic drift”) be lost over time in the population. Genetic variability helps populations fight adverse conditions, such as changes in the environment or outbreaks of disease. For both of these reasons, maintaining as large of an international Dartmoor population as possible is the best way to promote the health of the breed. Key to this is the term “interbreeding”…if the population is a certain size, even if large, but is divided into small communities that are isolated from each other (as is the currently the case for US Dartmoors), they are subject to the negative effects typical of small size populations. Animal conservation programs world-wide typically attempt to increase the size of the interbreeding population. Becoming a daughter society would also mean that Dartmoors in the US would be considered a true reservoir for the international Dartmoor community, in case that was needed (for example, if there were outbreaks of disease in populations in the UK and/or Europe). Thus, we would become an internationally accepted partner in the long-term preservation of Dartmoors. Good luck to your new society. Jane moore – Cayberry Dartmoor Stud, England. I would like to buy a Dartmoor pony in the US, where do I go?